Team-based online games: you’ll never find a more wretched hive of scum and villainy. From Halo to Call of Duty to Overwatch, the toxicity of some people is without bounds. Most of the time this is just people being jerks, finding amusement in verbal abuse, but there are some who have a reason: pure frustration. When you’re trying to play a game with random people, and there’s no cohesion or even flagrant idiots or trolls on your team. I know I’ve been guilty of tearing into my teammates when they’re acting like they don’t understand the game basics. I’m here to explain why these responses are garbage. Except, the point of most games is to win. These games are competitions, where you’re trying to reach the objective or prevent the team from reaching theirs. Whether that session is part of a competitive eSport or just played casually, that doesn’t change the goal. Therefore, claiming that people shouldn’t be trying to win is ridiculous when that’s the entire point. I realize that casual games don’t need to be treated like major sporting events, with harsh responses for small mistakes. That doesn’t mean I’m not going to try my best to win or avoid all basic strategy. If I go down to the park for a pick-up game of streetball, I don’t expect there to be a referee or that I’d be put on the bench for a foul. That doesn’t mean I’m not trying to score points or that I shouldn’t be called out when I’m taking shots into the other team’s basket. Yes, it’s just a game. Yes, it’s all for fun. No, that doesn’t mean you avoid trying to win or can’t criticize those doing just that. Medals don’t mean a thing! Except, while medals aren’t the end-all, they do provide a hint at who’s doing their job. Sure, that doesn’t mean that the individual is a great player or that they’re focusing where they need to be. Those medals, however, do suggest that they’re the best at the job on their team. Plus, if someone is showing consistently high achievements, then the medals do suggest they’re pulling their weight more than others. Maybe your friend is playing a bit aggressively in that street hockey game, leaving the goal undefended, but if he’s scoring the most points, then he’s obviously doing something. Somehow, though, those with the medals are accused of failure equally, which brings me to my last counterpoint. 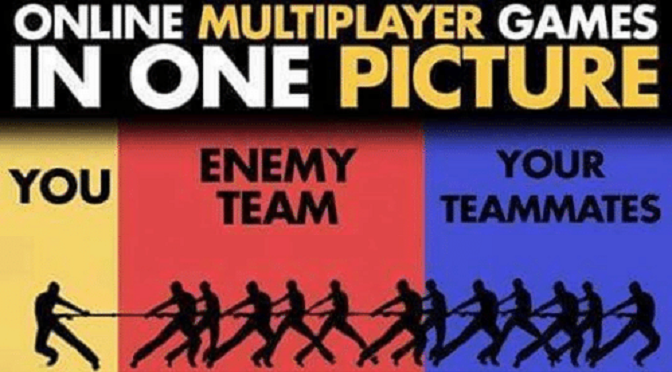 You’re part of the team, so it’s your fault too! We get it; these are team-based games. You’re supposed to work together to reach your goal, made even more daunting by having no practice with this random group of strangers. The problem is, a team is only as strong as its weakest member, and even the most solid player can’t carry everyone. So why blame that strongest player for the failures of everyone else? If the DPS aren’t following through on kills or the healers are running around shooting (instead of healing), what’s a player supposed to do? You can’t carry stupid, and you shouldn’t be penalized because you were forced to play with the 2016 Cleveland Browns. In fact, this is one of the biggest complaints about Competitive Play mode – that the “skill” rating has nothing to do with the player’s ability and everything to do with the luck of the draw on teammates. No, it’s not your fault just because you were on the losing team. Blame the weakest links, not the person who’s proven their worth on the team. I’m not saying that spewing foul language or vitriol is appropriate. Individuals who blow their tops over these things should learn to control themselves and provide constructive criticisms. (ironically I, of all people, need to take that advice). That doesn’t mean that the criticisms or messages are wrong. Even if you don’t like how the person is saying it, listen to them. Don’t just snap back with “it’s all for fun” or “you’re as much to blame!” That’s bulls–t. They may be jerks, but they’re at least doing their part; you’re the one not contesting the objective, running in solo, or dealing less damage than the tank. This is a game. The point is to win. The stats show who’s contributing. The best player can’t win it for everyone. Now put your big gamer shoes on, learn to play, and stop blaming the complainers.